Development camp? Coming right up. The third jewel of hockey's off-season triple crown is nearly upon us. On Monday morning, more than three dozen young hockey players will assemble at WinSport for fitness testing. This marks the start of Flames development camp. The first day on-ice will be Tuesday as Stockton coach Ryan Huska and his staff will lead the players through a skills development session. There will also be a power skating session. This will be repeated on Wednesday and camp will wrap up with a scrimmage on Thursday. A total of 37 players will be at the camp, which is one day shorter than it was last year. That total includes 10 players invited on a try-out. Of the 27 that are Flames property, two forwards won't be skating. Highly-touted Andrew Mangiapane (sports hernia-like injury) and Czech free agent signing Daniel Pribyl (knee) are both attending but won't be on the ice. Also not skating will be defenceman Riley Bruce (wrist). Visit the Flames website for a full breakdown of the player groupings and specific ice times for each group. Eight of the Flames nine 2016 draft picks will be in attendance. The only absentee is Belarusian seventh rounder Stepan Folkovsky. Another notable absentee is 2015 fifth rounder Pavel Karnaukhov, who was really impressive at the Young Stars rookie tournament last September. After two seasons in North America, he has left the Calgary Hitmen to reportedly try his hand in the KHL. 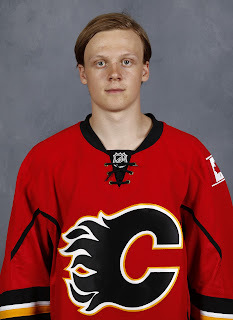 Older prospects not in the mix this year include Emile Poirier, Morgan Klimchuk, Brett Kulak and Garnet Hathaway. This isn't unusual. While frequently broken, there is a rule around how many development camps a player is to attend. The presence of 2012 draft picks Ryan Culkin and Jon Gillies is probably the result of them both coming off major injuries recently. This is a chance for them to be better prepared for September. The other 2012 pick that will be at the camp is Mark Jankowski as he begins his pro career after graduating from Providence College. I talked to him in April after he got a good taste of the AHL, getting into Stockton's final eight games after signing his entry-level contract. Once again, 2013 seventh rounder Rushan Rafikov is not participating. 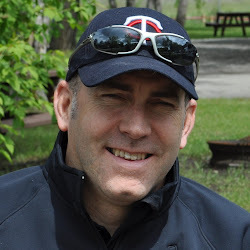 The management team worked really hard to try to get the Russian defenceman over to this camp a year or two ago only to run into all sorts of issues and headaches. They never did get him over and one wonders if at this point they've just given up trying. Talk about a busy summer. Just over a month ago, Tkachuk scored the OT winner as London won the Memorial Cup. 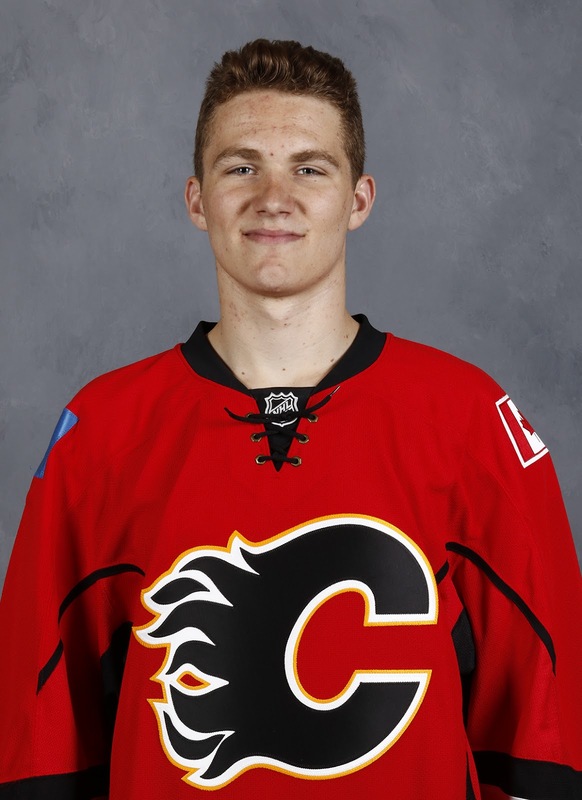 Ten days ago at the draft, the Flames were thrilled to get him sixth overall. He is the team's new prize prospect and notably will wear a 'regular' number on his back. Solidly built and a someone that plays with some edge, he has a chance to crack Calgary's roster come October. Did You Know: Matthew was 12 years old when his Dad Keith retired from the NHL after a career that saw him play in over 1,200 games, score over 500 goals and rack up over 1,000 points. Acquired: Signed as a free agent on June 13, 2016. Tall and athletic, Rittich comes to North America for the first time on a one-year, two-way deal. He will play in either the AHL or ECHL where he'll begin his acclimatization to North America. As noted in this piece from three weeks ago, he is coming off his best season. Scouts say he moves very well, has quick reactions and makes good adjustments. He's got lots to learn but the team likes his upside. 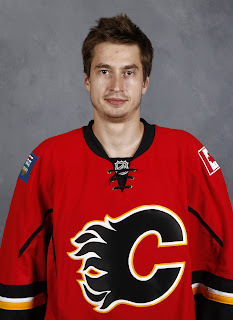 Did You Know: Rittich is six months younger than countrymen and Detroit Red Wings goalie Petr Mrazek. The smallest player taken in the 2016 NHL Draft, Phillips is a Calgary kid, who played midget for the Buffaloes. 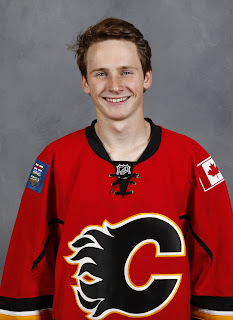 In his first WHL season last year played under ex-Flame Dave Lowry, he was the league's top-scoring rookie with 76 points (37 g, 39 a) in 72 games. As he'd have to be at his stature, he's shifty and highly-skilled and it will be fun to see him matched up against some much larger bodies. 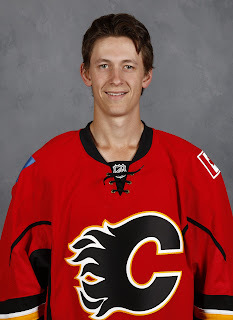 Did You Know: Picked with the same draft pick (166th) as Theoren Fleury and Andrew Mangiapane. He had another stellar year in Barrie where he led all OHL defencemen in assists (51), points (60) and shots on goal (220). He also led all d-men in points in the playoffs (2-13-15 in 15 gm) as Barrie reached the Conference final. Last year at dev camp, he was admittedly out of shape but I'd expect better fitness this time. 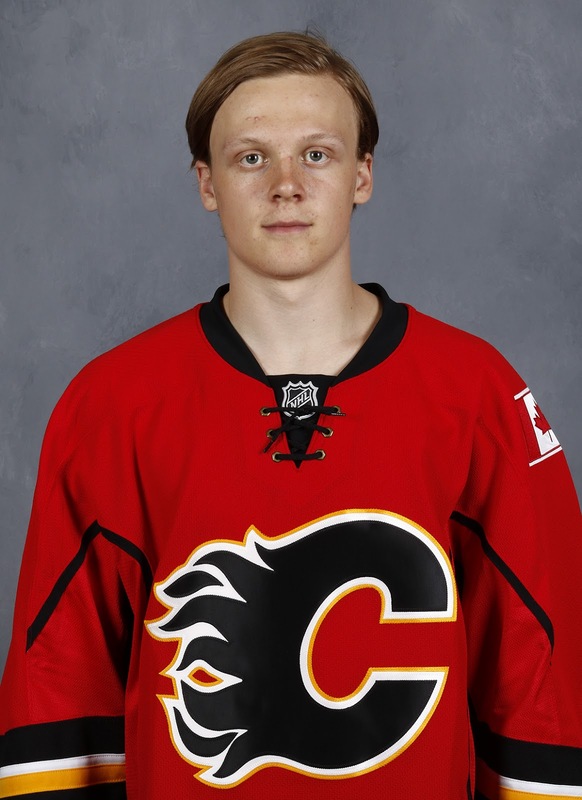 It's a big summer for Calgary's top D prospect, who I fully expect to turn pro. Did You Know: The solidly-built Swede has been seen training this off-season with Washington Capitals 2013 first rounder Andre Burakovsky. 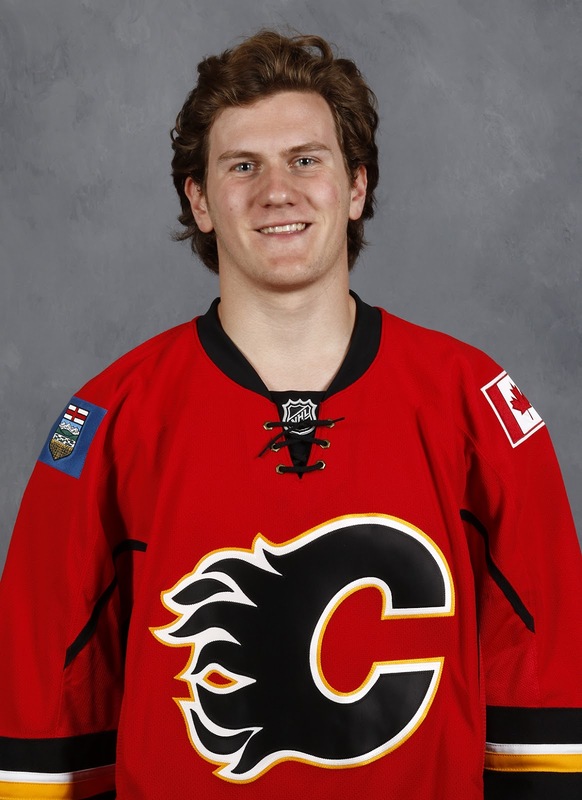 This is a first chance to catch a glimpse of Pollock, who is new to the Flames organization. He was acquired from the Stars as part of the trade in February that sent Kris Russell to Dallas. Pollock has seen his offensive production steadily rise throughout his four years in the WHL. He was Edmonton's leading scorer the past two seasons. He wears a letter, plays both special teams and has a big frame. Did You Know: The native of Sherwood Park won a Memorial Cup with the Oil Kings in 2014. Great skater and puck distributor, Culkin was a prospect on the rise two years ago. He had worked his way up to top pairing ice time in the AHL when he suffered a gruesome season-ending wrist injury. Anxious to bounce back last year, he injured a shoulder in Penticton for another major setback. When he finally did get back on the ice, his play was inconsistent. He needs to get himself back on the radar. Did You Know: For three of his junior seasons with Quebec (QMJHL), Patrick Roy was his coach. 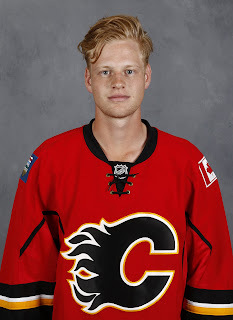 A playmaking centre, Lindstrom had a terrific year playing junior in his hometown in Sweden. Ranked No. 10 among European skaters by NHL Central Scouting, his story was Calgary had him ranked quite high and according to Tod Button, Director of Scouting, were going to draft him in the third round. But they opted to take Adam Fox instead, only to still get Lindstrom 30 picks later. Did You Know: In May, scored the shootout winner for Sweden in their semi-final victory over Canada at the U18 World Championships. While rare to see the Flames draft an undersized defenceman, especially that early in a draft, they are really high on this kid, who has drawn comparisons to Brian Rafalski. Capping off a year in which he set a USA National Team Development Program record for points by a defenceman, he also led all defencemen in scoring at the U18 World Championships where he was named the top blueliner. Did You Know: Will attend Harvard starting this fall, where he will play under coach and former NHLer Ted Donato. 50 - D Brandon Hickey - Fun to watch, Boston U. blue-liner is one of the team's top prospects. 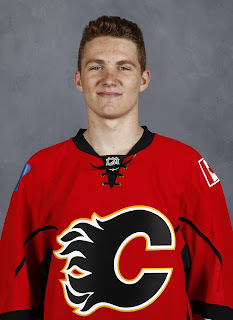 59 - C Dillon Dube - Cochrane kid and Flames 2nd rounder in 2016, is skilled with a good shot. 75 - RW Eetu Tuulola - Finnish 6th round pick in 2016 says his style is similar to Milan Lucic. 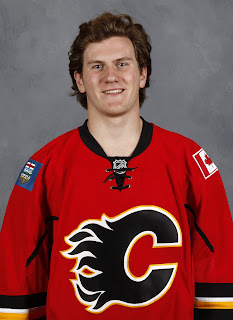 77 - C Mark Jankowski - Standout at last year's camp, can he repeat now that he has turned pro. Ranked 63rd among North American skaters by NHL Central Scouting, Burke was once again passed over in the 2016 NHL draft despite a huge offensive year in which the playmaking winger tied for the league lead with 82 assists. The Edmonton native is eligible to sign with any NHL team should he do enough to impress. 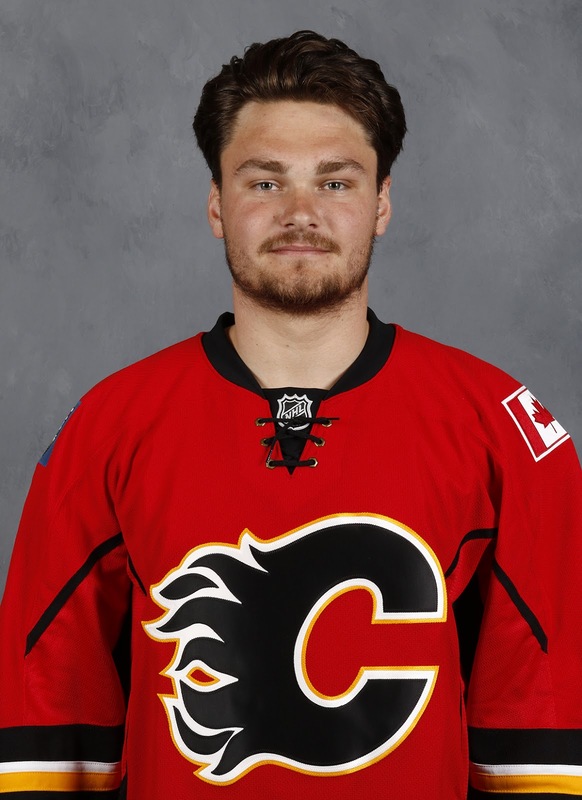 Did You Know: His big season last year came under rookie coach Brent Kisio, who spent the previous eight years in the Calgary Hitmen organization. 89 - RW Sheldon Rempal - Calgary kid off to Clarkson U. posted huge numbers in BCHL last year. 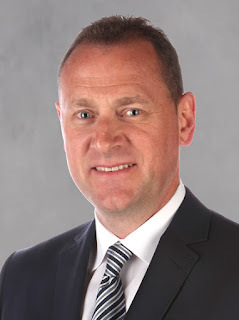 One of the things general manager Brad Treliving has been very insistent about since coming to Calgary as GM is he doesn't want guys going all-out at development camp. While he appreciates everyone's trying to make an impression, his point of emphasis is it's the beginning of July and off-season should be about building up for September and not trying to win a job in July. Some of the changes he has made with the annual camp is cutting back on the number of ice times and also the number of scrimmages. Nonetheless, it's always a great first opportunity to see the most recent draft picks on the ice for the first time and is a great send-off for fans into what's left of summer. Before too long, a lot of them -- less the Europeans and college kids -- will be back in town again for rookie camp and the 2016-17 will be underway. It's not quite 52 weeks a year this hockey business, but it's become darn close. Not that any of us mind. The dates you have for development camp are wrong. Monday is July 4 (the rest need to be adjusted accordingly) not July 5. I'm a day before my time, a true future thinker. Ya right. I'd like to say that's my life story, always out front of things but more so, more accurate would be running a few days behind my whole life! Thanks for the note. Got that fixed up. Much appreciated. Nice write up Darren, love reading your stuff. I'm really pulling for Jankowski and Ras to impress and force their way onto the big club. They both have a good chance although unlikely for 2016-17. Jankowski may need a couple years in the AHL and he's no sure thing. I think Andersson has the makings of a very good blueliner and could be on the big club as soon as 2017-18, but as a defenceman, they would be well served by taking it slow with him also. But there is reason to be optimistic about this team's future, for sure. Another thoughtful, in-depth article. Darren, you are my #1 person who I follow to discuss the Flames. Awesome work. That's very kind of you to say. Thanks for being a loyal reader and I appreciate the kind words.